"Penguin Personal Checks" product is already in your cart. Penguin Personal Checks have four images of these funny and unique birds that can't fly. 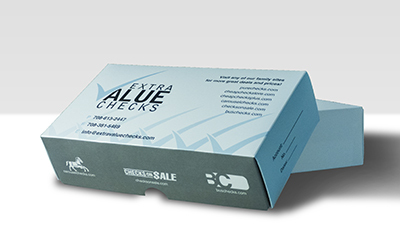 These Penguin check designs are available exclusively from Extra Value Checks. Emperor penguins are the largest of the 17 different species of penguins and can weigh up to 90 pounds. The smallest penguin is the Fairy penguin which weighs only about 2 pounds. The rarest penguin is the Yellow-eyed Penguin, with only about 5000 birds left along the southeastern coast and islands of New Zealand. While penguins may waddle around on the land, they are very graceful and fast swimmers spending about 75% of their lives in the sea. Their black and white coloring is great camouflage in the water, protecting them from natural predators such orcas, sharks, sea lions, and leopard seals. Unfortunately, their black tie attire does not protect them from human threats like oil spills, pollution, illegal poaching, and global warming. If you like penguins or just like everything to be in black and white, use these Penguin Personal Checks which are available in single and duplicate check format. Matching address labels and a coordinating checkbook cover are also available.